A Wits theatre and performance lecturer has received a final warning and resigned, following a student sustaining serious injuries during a supervised practical, which took place on May 22. Nondumiso Msimanga formally tendered her resignation at the end of June, after 19-year-old Michela Nordmann fell through the roof of the Wits Theatre while rehearsing an in-class performance with her group. According to Msimanga, the group of three students present on the day were rehearsing for a sight specific performance. She said that she had received authorisation from the department and the Wits Theatre to use the space. “It was the first time we were on the roof. I went to the roof when I was a student here, so I was familiar with the space. It should have been a safe enough space for them to do what they had to do,” said Msimanga. The first year student fell two storeys into the men’s bathroom, landing next to the sinks. She sustained various injuries, including “breaking my pelvis on my left-hand side, I broke it in two places, and I fractured my hip. I also broke my wrist and fractured two of my vertebrae from the fall”. 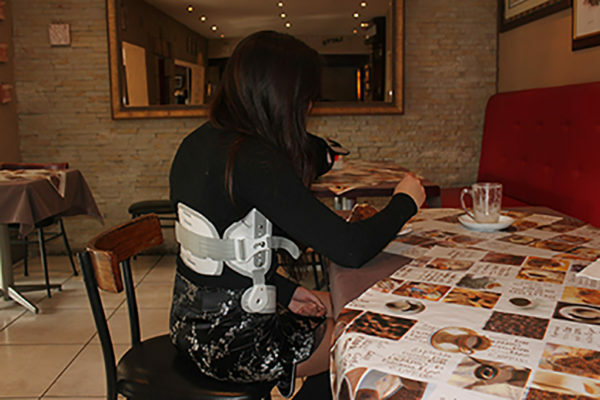 Wits student Michela Nordmann is forced to wear a back brace after falling through the roof of Wits Theatre during a practical. long-term problems with my spine,” she added. She was also forced to deregister from her BA in performing and visual arts, as she was medically unable to meet the practical requirements of the course. The Wits Employee Relations office initiated an investigation against Msimanga that concluded last month, subsequent to her resignation. According to Msimanga, the investigation recommended that she seek trauma counselling and provided her with “what was essentially a final warning”. Msimanga said that her resignation was prompted both by the incident and other personal reasons, however, “my resignation kind of concluded what they were going to do anyway,” she said. Wits Vuvuzela was unable to get official comment from the university at the time of publication. However, Nordmann said that her family had approached the Dean of Humanities, Ruksana Osman, and that the university is helping her with psychological support and physiotherapy. Msimanga will have served her resignation notice period at the end of September.